Read the latest issue of the Camp Bayou Buzzzzz! 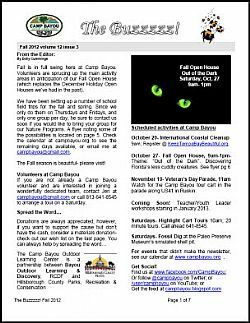 The Fall 2012 issue of the Buzzzzz!, the quarterly newsletter of Camp Bayou Outdoor Learning Center, is now available. What's going on at Camp Bayou? Coastal cleanup, an open house, fossil dig, cart tours, school field trips, and much more. Also check out photos from activities this summer!